The limit’s fifteen, and he may not get that many hits all year at this rate. A state Fish and Wildlife officer cited Mariners utilityman Willie Bloomquist on April 21 for unlawful recreational fishing for going over the stateâ€™s limits on razor clams while he was digging at Twin Harbors, according to a citation filed in Montesano Municipal Court. Bloomquist, 30, has paid a $50 fine after being issued the citation, a Grays Harbor District Court official said. The ticket issued to Bloomquist does not indicate how many clams over the limit he had harvested on April 21. Fish and Wildlife spokesman Craig Bartlett said Thursday that he could not reach the officer who issued the ticket to find out how far he was over the limit. Mariners spokeswoman Rebecca Hale hadnâ€™t heard of Bloomquistâ€™s citation from Fish and Wildlife, and she had no immediate comment. Digger is great and all, but I think Ken Digger Phelps would roll over in his grave, you know, if he were dead. you know, you’d think a big baseball star like Willie could afford a cooler rig …. If the man wants clams, let him have clams. Hey, at least he’d get to hang out with the “clam girl” with the smokin’ bod! Well, at least he wasn’t poaching geoduck, which could have led to some really tacky comments: Which one did Wee Willie want? Instead of ponies to cheer ourselves up, how about pictures of razor claims? 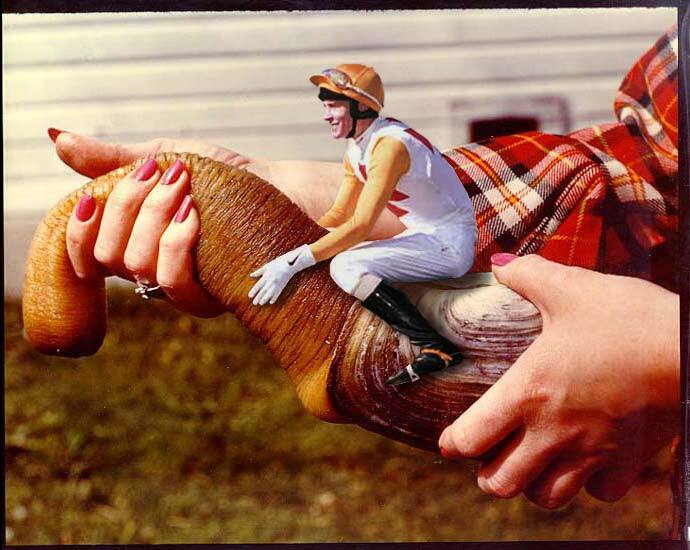 Although…with geoducks, we could have combined them and ponies like this. Derek – thanks for making me laugh with the dialogue bits. You ought to be writing for a sitcom. Willie trying to bribe a Fish and Wildlife officer; ha! Willie trying to bribe a Fish and Wildlife officer; ha! That almost sounds like the script from an episode of The Andy Griffith Show! Ooh…those two darn extra clams! Showing my age here a bit from childhood road trips back East, but it’s too bad in a way that Howard Johnson’s closed down all their restaurants — Willie could’ve gone in there and got all the clams he could eat for $4.95 and saved himself that extra $45! MSB — Quite a yummy menu! Actually, there’s still a Howard Johnson’s diner left in Lake Placid, NY with the legendary Tendersweet(r) Fried Clams on the menu. Maybe Willie and the boys can road trip up there in a few weeks when they go into Shea to play the Mets! This is the grittiest story I have ever heard. Um Kenji sort of didn’t catch that?